New Windsor Town Hall is located at 211 High Street, New Windsor, MD 21776; phone: 410-635-6575. Photo: Mary J. Curry House, ca. 1899, 133 Main Street, New Windsor Historic District, New Windsor, MD. The Historic District was listed on the National Register of Historic Places in 1997. Photograph by Kenneth M. Short, 1996, for nomination document, New Windsor Historic District, Carroll County, MD, NR# 94001103, National Park Service, National Register of Historic Places. New Windsor is a small Piedmont town in western Carroll County, Maryland. Originally laid out in 1797 by Isaac Atlee at the confluence of the Monocacy Road and the Buffalo Road, it experienced steady growth along one main street in the first half of the 19th century. Early in the second half of the 19th century a grid plan was developed, and this was expanded in the early 20th century. Building activity seems to have peaked in the period ca. 1860-1873 and ca. 1898-1915, but in general there was steady growth in the intervening years. 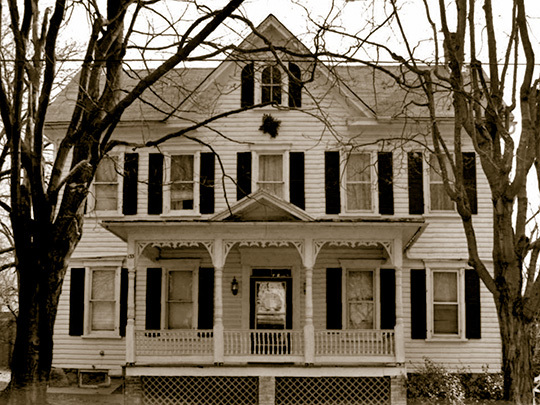 Much of this building was in the local vernacular of Carroll County, but this began to change considerably in the 1870s and 1880s, as nationally popular architectural styles began to exert an influence on New Windsor's streetscapes. New Windsor is a reflection of Piedmont Town development, local building practices and the influence of national architectural trends and traditions. This infrastructure illustrates the way of life of a community from the formative period of Carroll County, ca. 1796, to the beginning of the second World War in 1941. Unlike most towns in Carroll County, New Windsor developed not only as a focal point for the surrounding farm community, but also served as a summer resort town for people from Baltimore and Washington from its beginning. New Windsor is built upon two land grants originally patented by Charles Carroll, "Five Daughters" and "New Windsor." Two 18th-century roads passed through this region. The Monocacy road connected the newly settled region around the Monocacy River Valley to Baltimore. It was a local road opened through usage and not by the government. The Buffalo road was laid out by a commission to connect Annapolis with Buffalo, N. Y. Around 1788 Isaac Richardson Atlee visited this area, looking to relocate from the Lancaster area, and decided that there was sufficient business to build a small tavern at the intersection of these two thoroughfares. He met with success and the discovery of a sulphur spring with supposed medicinal qualities brought more people to the area. One of these visitors located here and, according to local historian Frank J. Devilbiss, graduated from spring water to rum at Atlee's bar. He ran up a considerable bill, along with gambling debts, and was finally forced to turn his estate over to Atlee as partial payment. Atlee received a quit claim deed from Jonathan Hyde in October 1795, and the following year had 28 lots platted to create the town of New Windsor. Kenneth M. Short, Historic Planner, Carroll County Department of Planning, New Windsor Historic District, Carroll County, MD, nomination document, 1996, National Park Service, National Register of Historic Places, Washington, D.C.